Reading progress update: I've read 287 out of 321 pages. 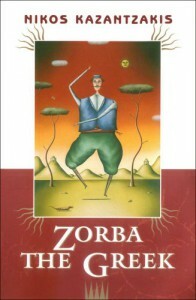 What I thought was just going to be a straight forward-story about Zorba is in fact a very philosophical story about all things: religion, politics, and life in general. Why I'm this surprised is a mystery - Nikos Kazantzakis was a philosopher and all, but either ways, I'm two chapters from finishing it. Will be sorry when it ends. It's a great read.